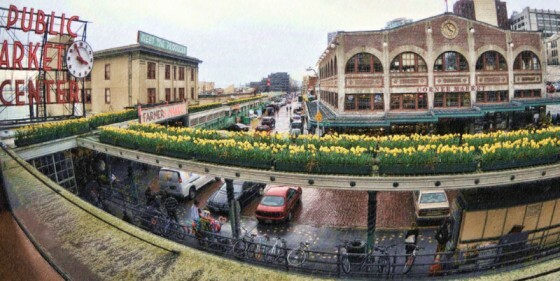 The Pike Place Market is the heart and soul of the city. Starting in 1907 on the corner of First and Pike Place, the market has been continuously running ever since. With over 10 million visitors per year, tourists and locals love this place. Between the summers of 1906 and 1907, food prices rose sharply in Seattle. Onions that had been ten cents a pound were now a $1 (keep in mind John Nordstrom sold a pair of new shoes for $2 a pair). The boom in prices followed the increase in lumber prices following the San Francisco earthquake and fire in April of 1906. But also because the middlemen were gouging the consumer. 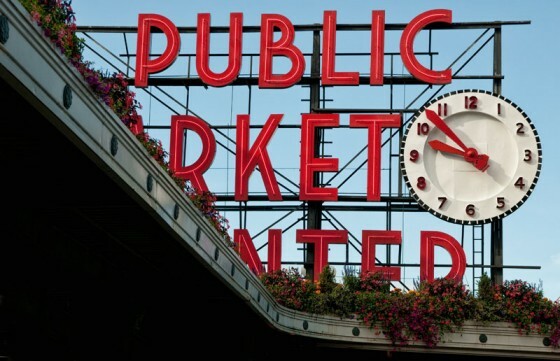 Due to this frustration, the Seattle City Council passed an ordinance for Pike Place as a site for a farmer’s market and the Pike Place Market was born. The first day only seven farmers showed up to sell their produce. Rumors from threatening boycotts by middlemen to death threats made its way around the city. This didn’t stop over 10,000 people from showing up that day. The first day was such a success that the next Saturday, over 70 farmers made their way to the market with just as many waiting customers. In 1912, Three Girls Bakery opened in the Corner Market Building on the corner of First and Pike (where Pike Place Flowers is now located). Advertising two loaves of bread for 15 cents: “A good deal for your money.” They celebrated their 100th anniversary in 2012 and are the oldest business in the market. In 1918 the City of Seattle created City Fish to counter the high prices of fish when there was a sudden rise in the cost of salmon to 25 cents a lb. This additional competition brought the salmon prices back to ten cents a lb. and the city gave up its role of fishmonger and price fixer after the war. By 1922 the buildings we see today were completed and the market was well on its way to becoming the heart and soul of the city. In 1928, the trademark clock and neon sign found its home and was one of the first outdoor neons signs to be installed on the West Coast. In 1941 Sanitary Market building burns just days after the bombing of Pearl Harbor. By April of 1942 the market lost over half of its farmers to the internment camps for Japanese Americans, leaving hundreds of stalls empty. By 1969 the market was in bad shape and there was talk of demolishing the market. Friends of the Market gathered 53,000 voter signatures to save the Market from the wrecking ball and by 1971 it was on the National Register of Historic Places. 1971 was the year that Starbucks opened their first store at Pike Place and Virginia, just a few doors down from what we now know as the “Original” Starbucks. In 1985, donors were able to purchase a floor tile for $35 to help renovate the market. Today over 46,000 named tiles line the arcade. 1986 Rachel the pig debuts under the iconic sign and clock. She helps raise over $10,000 each year for market services. Exploring the market is a great way to spend a couple of hours, and don’t forget your camera to create our own photo magic. The market is ever changing and you’ll want to explore all the different levels not just the main walk area. You should give yourself at least a couple of hours to walk around and see all the different shops and photo opportunities. The Busker, also known as performers, are great to photograph. Many of them work at the market full time and if you do take a photo of these performers, please be sure to tip. Our friend Farell, the Balloon guy, is real comfortable with you take portraits up close. He might talk your ear off, but he is sure to give you some fun photos to take back home. The Original Starbucks is always crowded during the day. If you want an interior shot, wait until after 6 PM. Being the third busiest Starbucks in the world, you know it’s going to be crowded. (Shibuya Crossing in Tokyo is the busiest in the world). If you can only get there during the day, you can take photos of the musicians out front. Try to include the long line of people and the original logo on the window to give a great sense of place. 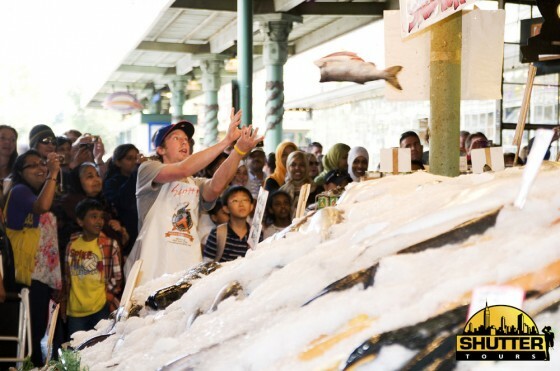 We like to take our fish stand photos at Pure Foods as the image seen above. It is much less crowded than the other stands and we think they have better displays for our photos. They also have the best smoked salmon in the market which was even written up in Sunset Magazine. These guys are world famous for throwing fish and they are great fun to watch. If you want to capture a photo such as the one above, use a high speed shutter or put your camera in sports mode to stop the action. Rated the “Second germiest place in the World” by Tripadvisor.com reviewers, you don’t want to miss the gumwall. Located in Post Alley right around the corner from Ghost Alley Espresso, home of the Market Ghost Tours, this is a sight to be seen. It all got started in the 1990’s when patrons of the Market Theatre were asked to leave their gum outside. People started using the wall as a perfect spot to put their gum and sticking coins in the gum. Theatre attendants were asked twice to clean the wall, but by 1999 they gave up as it had become such a big tourist attraction. Just one note, the Seattle Underground Tours are not located in the Pike Place Market, you’ll find the underground tours in Pioneer Square. The Pike Place Market hours may be a bit deceiving, you can expect most vendors to be there from about 8 AM until 5 PM, but restaurants and bars are open later. 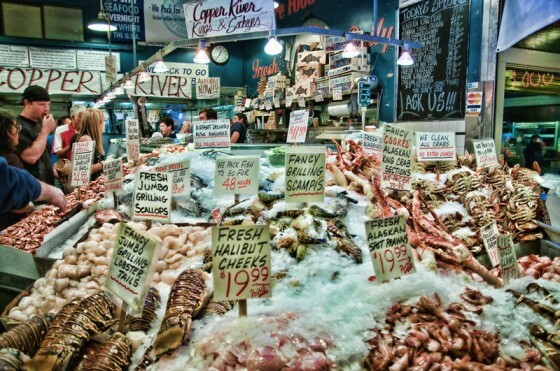 This entry was posted in Seattle Info and tagged fish market, Food Tour, ghost tour, pike market, pike place fish market, pike place market, pike place market hours, pikes market, pikes place market, seafood market, Seattle, Seattle underground tour, Things to do in Seattle. Bookmark the permalink.